Lots of people don’t like lavender, and I have no real idea why. Its distinctive scent is unusual in having both floral and herbal facets to the scent, and the smell can range from menthol, to balsam, or (just a little, if you get a screechy batch) like cat pee. But a good lavender fragrance is a thing of beauty, and this week, I thought I’d wear my favourite lavender fragrances and show just how many different faces lavender can wear. On Monday, I wore the dirty lavender of Jicky by Guerlain. Every perfume lover who considers themselves a bit of a perfumista owns a bottle of Jicky, because it is a classic, created in the late 1880’s, and one of the first fragrances to include synthetic ingredients, When I first discovered Jicky, it was long before I knew anything about perfume, and I just thought it didn’t smell like anything else, it smells of coal tar, and leather soap, and it actually took me several years to figure out that the herbal-fresh scent that plays amongst the leather scraps in the coalyard was lavender, and that’s when Jicky finally made sense to me. Less a perfume, and more a statement of intent, Jicky’s the lavender scent that won’t remind you of your granny. Ironic really, as your granny probably did wear it at some point. My bottle dates back to the early 90’s and it’s a full-throated roar of a fragrance, even now. Tuesday brought the spicy, warm lavender of Diptyque’s Eau de Lavande. Unlike most of the lavenders on this page (Jicky is the main exception) which have a cool, or fresh-seeming quality, Eau de Lavande is warm and cosy, positively inviting cuddles and becoming a beguiling skin scent at the end as a result. Opening with cardamom and ground coriander root alongside nutmeg, the menthol of the lavender is somewhat muted, and it’s only after wearing it for a while does the lavender reveal itself. There are some lightly bruised woods at the end, which comes quickly because this is an eau de toilette, and it’s simply a pleasure to wear. I’d love this in an EDP concentration, and I’d probably never wear anything else, if it did come in just a little stronger formulation. On Wednesdays I wore the woody-chocolate of Creed’s Aberdeen Lavander (sic), which to me starts off quite funky-smelling and rather animalic, but which softens slowly over time to reveal an unexpectedly creamy-chocolate aspect to the lavender flower, atop a leathery base. I’ve seen it described as a “modern Jicky”, and, whilst I wouldn’t go that far (it’s cleaner and far more definitively “lavendery” than Jicky), it’s certainly a very interesting lavender to wear. 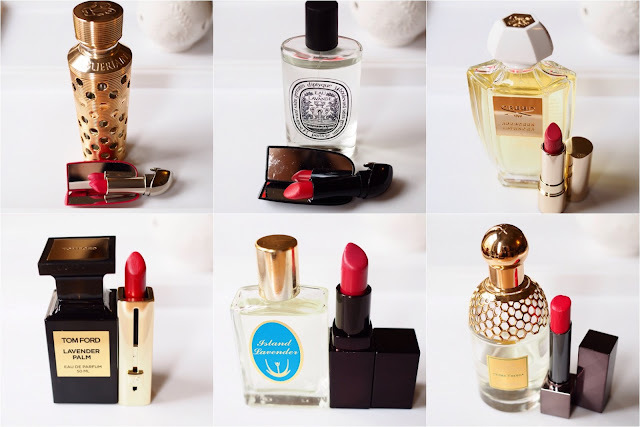 Interestingly, it’s the only one on this list that I could easily convince MrLippie to wear, having more elements of the “fougere”-style of fragrance than many of the perfumes on this list. Thursday brought the gender-bending citrus lavender of Tom Ford’s Lavender Palm. A fragrance I’ve written about before, and enjoyed, I described it back then as smelling like “a burly granny with a mean right hook”, and, whilst I wouldn’t go quite that far this time around, I can see what I was getting at. A lively dance of bergamot and lavender in the opening gives a slightly misleading fresh quality to the first few moments of wear, before the scent opens out, and becomes a darker, smokier proposition, filled with vetiver and olibanum. Somehow meant to evoke California, it’s more of a damp English garden, and a little tweedy. A lavender you wouldn’t be surprised to find Miss Marple wearing, showcasing the steel trap mind behind the affable appearance. On Friday I wore the classic lavender soliflore of Caldey Island Lavender. Much closer in form (though not in execution) to a classic lavender “toilet water”, and most certainly a bargain, Caldey Island lavender begins with a photo-realistic peppermint whoosh, like you’ve just inhaled an entire packet of polos in one go, then swiftly settles into a cool menthol-herbal lavender which smells precisely as if you’ve crushed a few fresh lavender blooms in your palm, and that’s how it stays, right until it disappears. Simply beautiful. A few drops of this added to the water in your iron, by the way, is divine, and can make even that most-boring of chores more of a pleasure. This week, I also work lipstick (as pictured), but, who wants to talk about lipstick when there’s lavender to discuss?